So…School is out. Vacation is over. Real life has started again. That means it’s time to get back to writing. Yay! In that direction, I went through the “Writing” folder on my computer on Sunday. And found 67 pages of a story I don’t even remember writing, for NaNo 3 years ago. I read probably 15 pages before I believed that I actually wrote it. It’s a YA about the Sirens and Spartans, but set in the here-and-now. It was kind of like having an out-of-body experience, reading through something I have no memory of writing. (The writing took place about 6 months pre-stroke, and I stopped when my depression got really bad). Yesterday, I found the story notebook for my newly rediscovered story. That’s the good news. The bad news…in it is one piece of paper with 40 words on it. Mainly character names. No plot ideas, no outline, nothing else. Also some printed out research on sirens and the like. It appears that I will be basically starting from scratch, because, let’s face it, I’m totally sucked into the 67 pages of MS I have. I was seriously like “Did I write this? It’s really good!” Guess what just got bumped to the top of my to-write list? That’s not strictly true. I want to get going on The Fall again, too. I’ve only got a few chapters written, and I need to change some stuff that my Muse gave me over the past few months when I wasn’t supposed to be writing (my Muse is, apparently, a rebel). An outline would, perhaps, be helpful. Or, heck, even a basic idea of where the story was going. At this point, I’m flailing around in the fog, only able to see two steps in front of me. I also discovered a tiny bit of another story, along with its notebook and partial outline, as well as a good bit of notes for a third story. I think 4 WIPs is a bit excessive, even for me. My Muse either fainted from excitement, or went on strike, I’m not sure which. Let’s not forget my to-be-revised list, which grows ever longer. Sigh…Think I’m gonna start with Witches, though. Cutting down that 300,000 word behemoth is going to be…tricky, but the characters are talking to me. 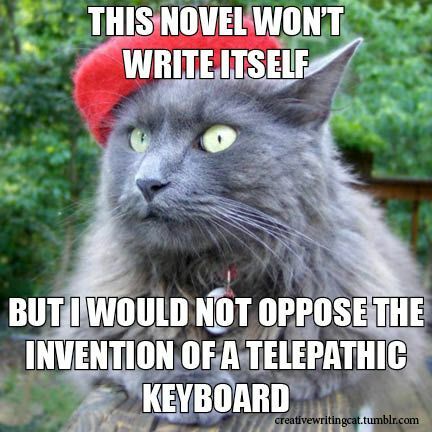 Or, possibly, I’m hearing voices….Yeah, it could be either one. Writing question of the day: does anyone else juggle multiple stories at the same time? Some tips would be helpful. And very much appreciated. 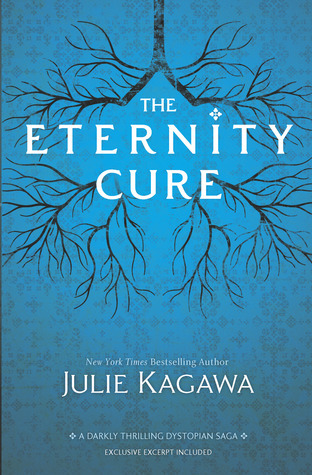 Julie Kagawa, best-selling author of The Iron Fey series, has a new book out in her The Blood of Eden series, The Eternity Cure. Set in a dystopian future where a deadly virus has destroyed most of the population, human beings are now reduced to scavengers…and to nothing more than food for vampires. Allison Sekemoto has lost everything she cared about. Her friends. Her humanity. Her love. But she still has a chance to get one thing back: her creator, Kanin, kidnapped by the Psycho Vamp who almost destroyed her once. Following the call of blood, Allie follows Kanin’s trail and finds more than she ever bargained for. Forced to work with an old enemy—and someone she never thought she’d see again—she races to rescue Kanin in an effort to find a cure for the disease that will wipe out all life on earth if they can’t stop it. A psychotic vampire, a vindictive Prince, and heat-wrenching betrayal aren’t enough to deter Allie, but will a more devastating loss finally destroy her? The dystopian world of New Covington is darker and more dangerous this time around. Allie is stronger, but she’s struggling to hang on to her humanity—and her hope. The Eternity Cure takes the reader from the pinnacles of hope to the very depths of despair, on the roller-coaster ride to save earth from complete destruction.